Bored with my looks, I thought it was time for me to give myself a new look. The easiest option available for me was to try a new hair color. 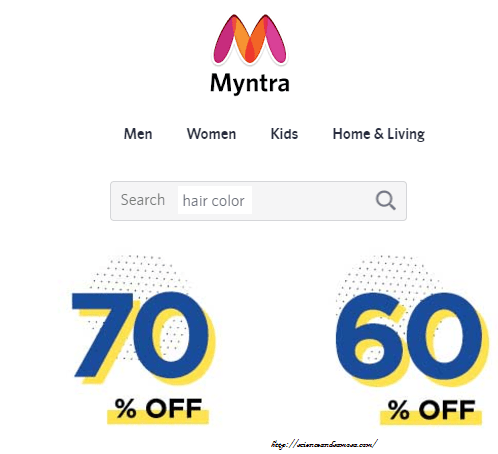 I headed straight to my favorite Online Shopping portal Myntra. I was amazed by seeing the type and variety of Hair color products. There were both chemical and ayurvedic products. All together there were 16 color shades !!!. There were both Permanent and Semi permanent products. I got confused and was not able to decide on which one to choose. So decided to read and understand more about Hair Color. In 1909 French chemist Eugene Schuller, created the first safe commercial hair color using the chemical paraphenylenediamine. From then on both men and women are using this product. Hair colors are grouped into four, based on color resistance, into temporary, semi-permanent, demi permanent and permanent. Temporary hair color as the name suggests is for temporary application. It provides instant color to hair and washes out much quicker. Temporary hair color is available as rinses, shampoos, gels, sprays, and foams. Compared to semi-permanent and permanent hair color, it is typically brighter and more vibrant. Temporary hair color is used for special occasions such as costume parties and Halloween. Semi-permanent hair color applies color to the hair surface. It helps in enhancing natural color of hair. Semi-permanent hair dye has smaller molecules compared to temporary dyes, and hence can partially penetrate the hair shaft. The color will last 4–5 hair wash or a few weeks. Semi-permanents contains very low levels of developer, peroxide or ammonia. They are hence safer for damaged or fragile hair. Demi Permanent Hair Color lasts 12-24 washes. Demi-permanent hair color is similar to permanent hair color, but contains an alkaline agent other than ammonia like ethanolamine, sodium carbonate. Hydrogen peroxide levels in developer too may be lower than what is used with permanent hair color. Demi-permanents are much more effective in covering gray hair than semi-permanents. As the name imply, permanent hair color lasts the most. Permanent hair color grows out from the root, and hence need to be reapplied only every four to eight weeks or depending on how fast hair grows. Permanent hair colors are available in a variety of forms including Gels, liquids and creams. Permanent hair colors mostly follow a two-step process – 1) first removes the original color of the hair and 2) then deposits a new color. Ammonia is the widely used alkaline chemical that opens the cuticle. It allows the hair color to penetrate the cortex of the hair. Ammonia being a small molecule easily enters the hair and cause significant swelling of the cuticles. This helps deeper penetration of the dye and enables strong color formation. Peroxide is used as the oxidizing agent or developer. The developer removes pre-existing color. Peroxide removes chemical bonds in hair and releases sulfur. This accounts for the characteristic odor of hair coloring. The conditioners applied later, closes the cuticle after coloring to seal in and protect the new color. Instead of Ammonia, derivatives of ammonia such as monoethanolamine (MEA) or diethanolamine is used. They too cause the cuticles of the hair to swell and open, but not as efficiently as with ammonia. Hence an oil delivery system is added to the mix. This oil facilitates the diffusion of monoethanolamine deeper into the hair. This helps in giving results as good as with ammonia. Finally the condition of hair after coloring will depend on many factors besides the dye in itself like initial condition of hair, shade and level of lift expected, frequency of usage, brand used etc. 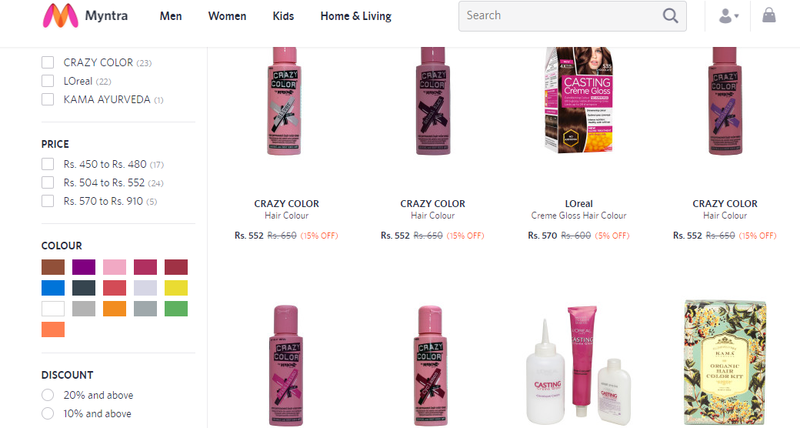 After understanding all about Hair color, now I am all set to shop for Hair color. Heading straight to Online Shopping portal Myntra. Do not forget to avail great discounts given by them. Disclaimer: I have done my part of research to provide my readers with most precise information. But request you to use your judgment before taking any decisions based on the information in this blog. I’ve never been a big fan of hair colouring. I prefer henna anyday. But it is nice to learn about hair colouring. I had no idea there were 4 differnt types. Interesting read. This post also reminds me that my head is covered in grey ever since I have been busy mommying. I am going to get a box of colour for myself soon. Very useful post for people who’re in two minds about coloring their hair. Thank you! I am a regular hair colour kind of person – thanks for this informative post! Sissy loves coloring her hairs! Sharing this post with her! I am gonna order one of these definitely . It would be so much fun ✌Thanks for sharing this information . This is the very first page where in I am getting this piece of info. Such an informative article on hair coloring.. will be helpful when I plan to color my hair. You’ve shared some detailed information about hair colour. I love colouring too but fearing hairloss prefer to go for mehndi rather than chemical colours. I have tried hair color only once but now after grasping so much details from your article, I feel like trying out more colors. Very informative post gal.. I color my hair often it’s a good article and it’s so helpful..
I’m actually looking for good hair colours to try! This was a really useful information for me! Thanks!